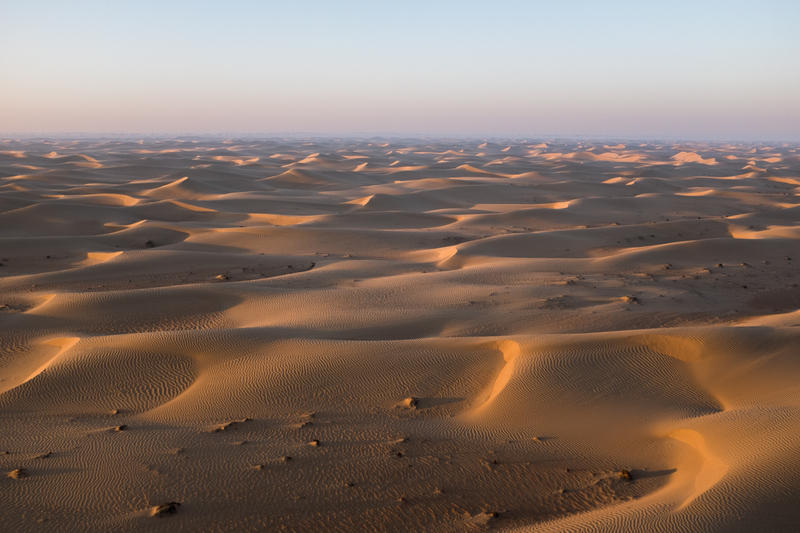 Morning light on the desert between the UAE and Saudi Arabia. 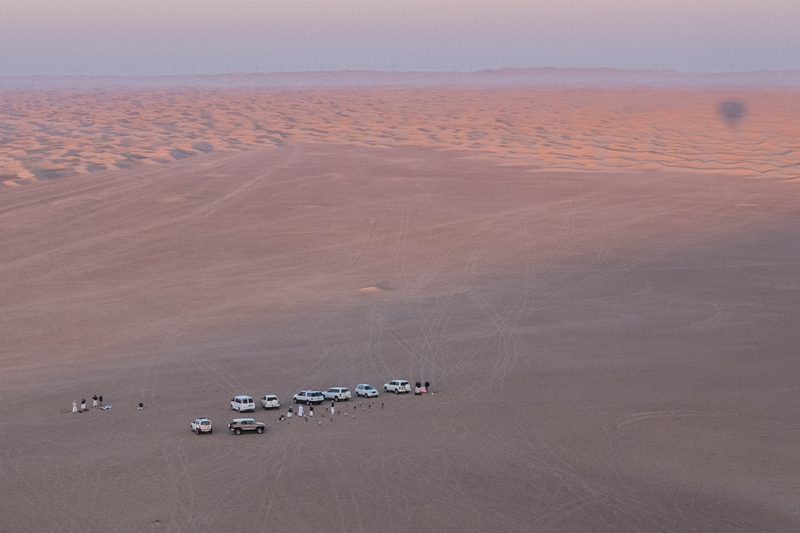 Gliding silently above the Dubai desert on a dawn hot air balloon flight, one’s thoughts can easily drift into contemplation of the centuries of Bedouin tribal movements between the coastal fishing and trading areas to the desert oases where they farmed dates and vegetables. The sudden appearance below of a group of Emirati falconers out for a morning hunt with their treasured birds is a reminder that this is an old culture with strong traditions. Emiratis out for a morning hunt with their prized falcons. Remember, too, that until Emirates oil started pumping into the world marketplace after World War II, very little in the way of modern buildings existed here. The fact that the balloon’s basket is shared today by visitors from England, Italy, Germany, Canada and the U.S. reveals another story: Dubai is a now a robust and popular commercial and tourism destination. 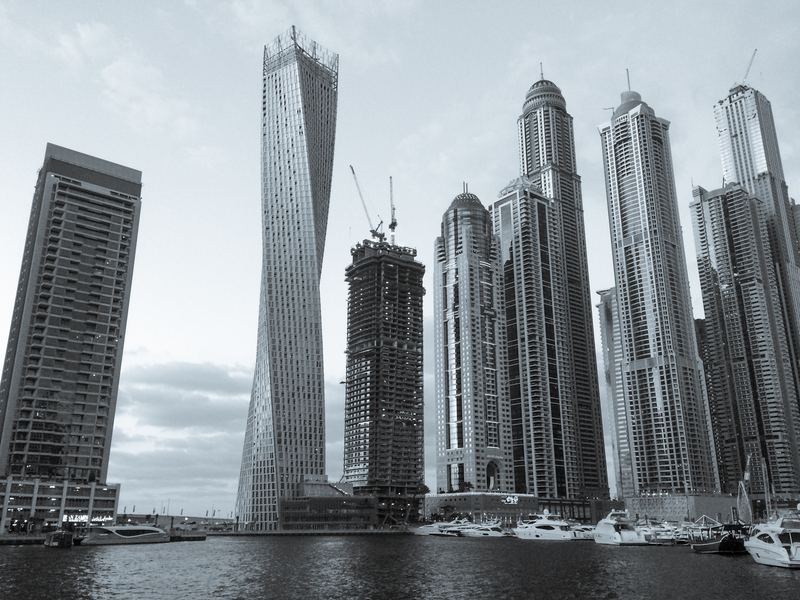 Construction and modernization continues apace in Dubai. This is a view of the Dubai Yacht Harbor area from Palm Island, one of the world’s largest man-made islands. The 16-hour non-stop flight from LAX’s Bradley International Terminal on Emirates Airlines follows an extraordinary route over Greenland, Central Russia and then down through an airway over the Arabian Gulf with Iran to the east and Iraq to the west. The seat-back video screen shows exotic names of cities along the flight path and the 3-camera view of the flight is fun, especially during a night landing. The remarkable double-decked A380 Airbus is clean and comfortable, even in economy, and the flight is well-staffed with an international crew. If you just won the lottery you can also book a private apartment in first class. The flight plan of the LAX-Dubai Emirates Airlines flight is nothing less than fascinating for a traveler and the seatback screen keeps you updated. 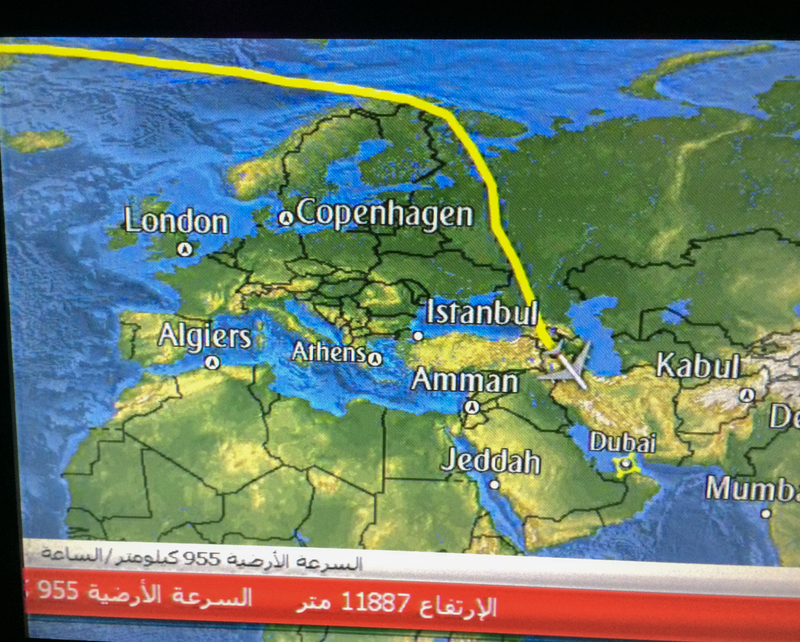 Yes, that’s St. Petersburg and Moscow you just flew over and, yes, that’s Iran off the port side. 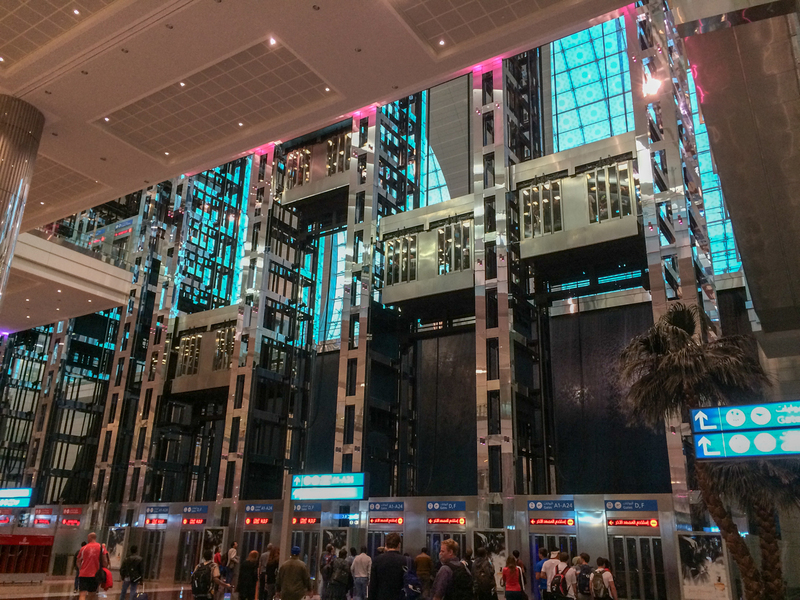 There is a multi-story waterfall to greet you at Dubai International Airport. Customs and Immigration was polite, swift and welcoming; staffed equally by male and female officers. The Dubai International Airport is vast and amazing. It includes a dramatic waterfall. 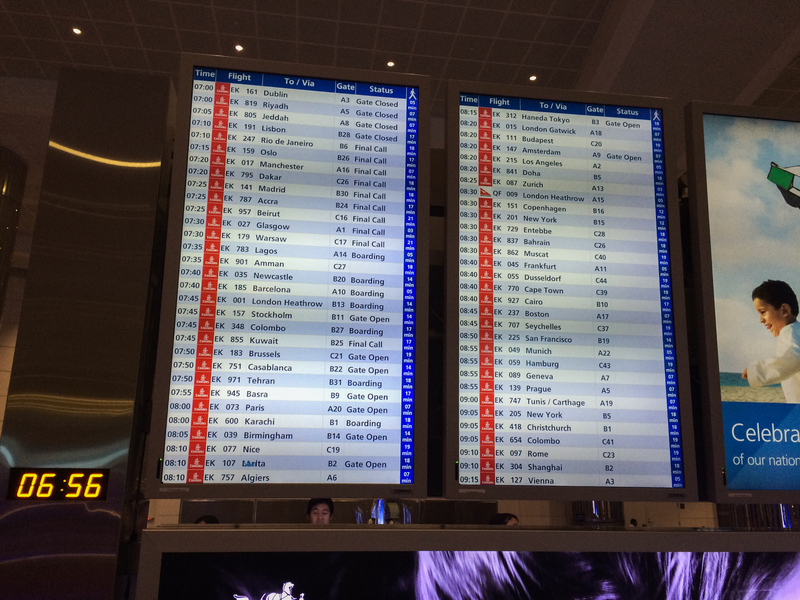 The flight reader board at Dubai International Airport gives you an idea of Dubai as a hub. The first stop on this trip was the grand opening of Four Seasons Dubai, right on the Gulf, and very much up to Four Seasons standards. As expected, the rooms are luxurious, with views of the water and grounds and have an understated flavor of Dubai and the Middle East about them. All the rooms at Four Seasons Dubai have dramatic views of the Arabian Gulf. 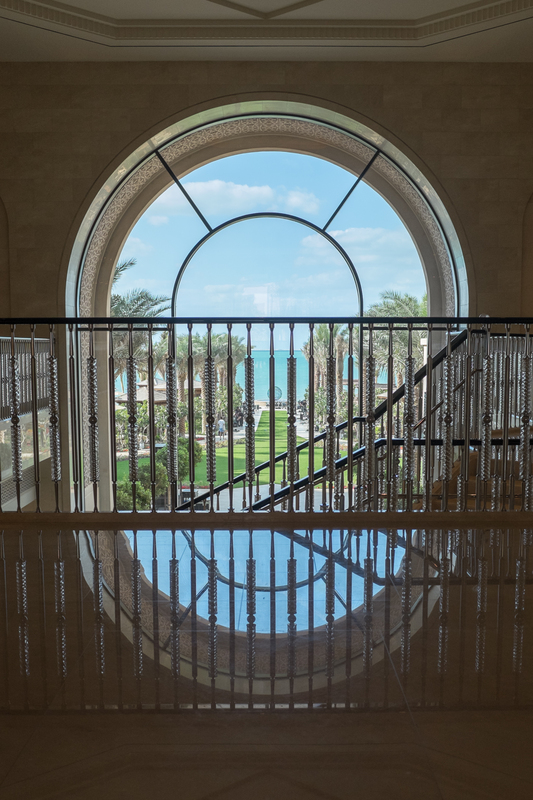 The Arabesque theme extends throughout the resort in an elegant way, from the lattice work and the window shapes in the lobby up to the chic rooftop Mercury Lounge and its dazzling night views of the futuristic Dubai skyline. The company’s designers, supervised by VP-Design Dana Kalczak, have a way of swirling the local culture around their properties and Four Seasons Dubai is no exception. With a nod to British times, Hendrick’s Bar, off the lobby, is a club atmosphere and an elegant one. A comfortable, well-appointed place for a martini or gin and tonic at cocktail hour. 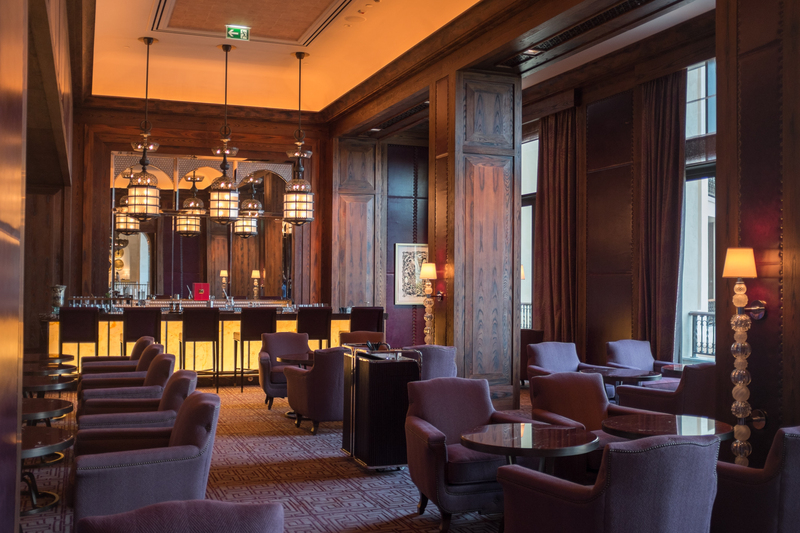 The stately Hendricks Bar off Four Seasons Dubai’s lobby is an elegant throwback to a British Club. A good place for gin. 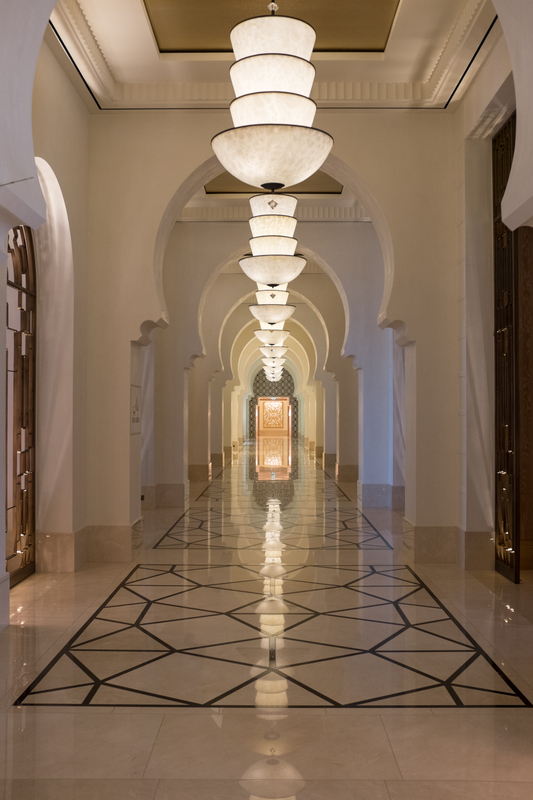 The Arabesque themes carry through Four Seasons Dubai and enhance the character of one’s stay. Cleverly incorporated views abound at Four Seasons Dubai. 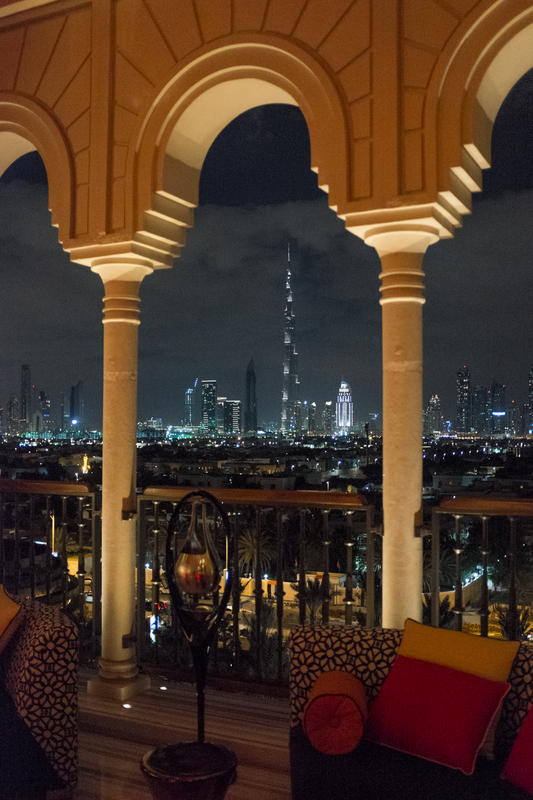 The Mercury Lounge at Four Seasons Dubai is a great place to relax and contemplate the remarkable transition of Dubai from a Bedouin village to an ultra modern international tourism and commercial hub. The Burj Kalifa is the tall building in the distance. We also had some clever seafood dishes at Sea Fu, including a seemingly minutes-fresh Alaskan Cod. Here’s to jet cargo service. Chef de Cuisine Pierre Barusta is a talented innovator and waves a French and Asian wand across a wide range of meal choices in a modern, intimate setting. The well-executed international theme at Suq, the more casual of the in-house dining choices at Four Seasons Dubai, is great for morning meet-ups and fun to play in for meal choices. Giving the range of palates of guests, there are stations for just about everything. You can fill your plate with South Asian food on one trip to the serving area and return for a reliable omelet cooked to order. Overseen by Executive Chef Gilles Arzur, both Suq and Sea Fu also have beckoning patios if al fresco dining in the warm Dubai air calls to you. 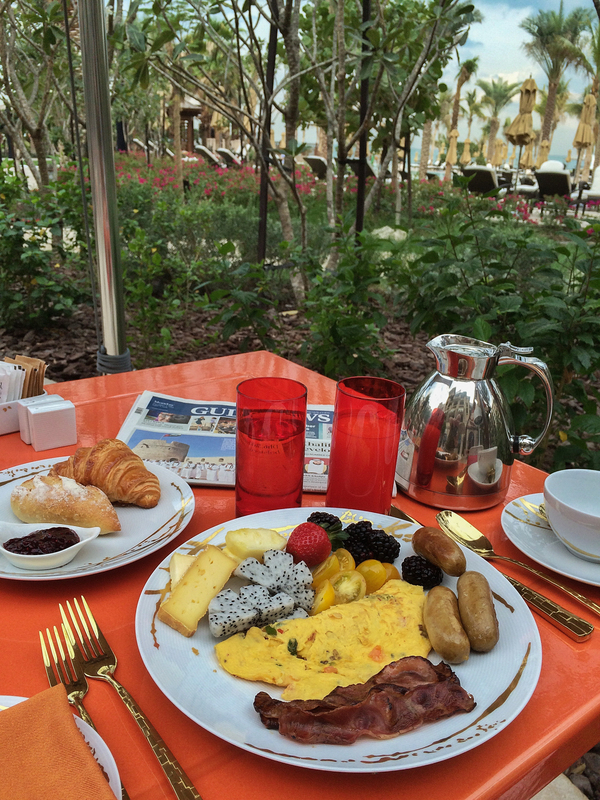 Confessions of a hearty breakfast fan: The buffet at Suq is addictive. Finally, regarding Four Seasons Dubai, it is truly impressive how the international staff conveys honest hospitality and charm while not seeming overly obsequious, all the while remembering guests’ names almost magically. When I mentioned this to Four Seasons Regional VP and General Manager Simon Casson he described his thorough hiring process and how he can see if an acumen for customer service is “in there” with his applicants. 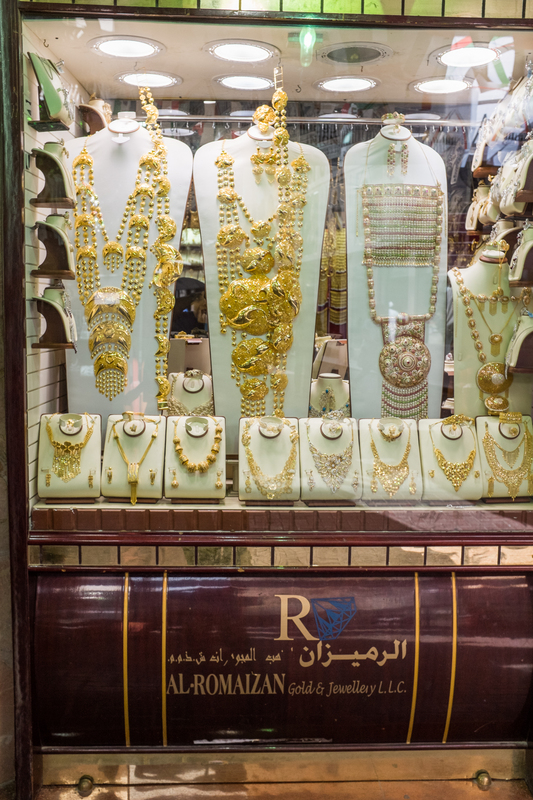 In Dubai’s old Gold Souk, all that glitters, in fact, is gold. Selling phony gold here is not tolerated. Everyone hears about The Dubai Mail but not everyone visits the old Souk area which includes The Gold Souk (no fake gold here), The Spice Souk and the smaller Flower Market. Located along historic Dubai Creek, which divides the Deira and Bur Dubai sections of the city, these souks are crammed with dazzling gold shops whose intricate wares gleam from the show windows. Spices from Iran, India and other exotic sources are displayed in barrels and bins, filling the air with tangy aromas. 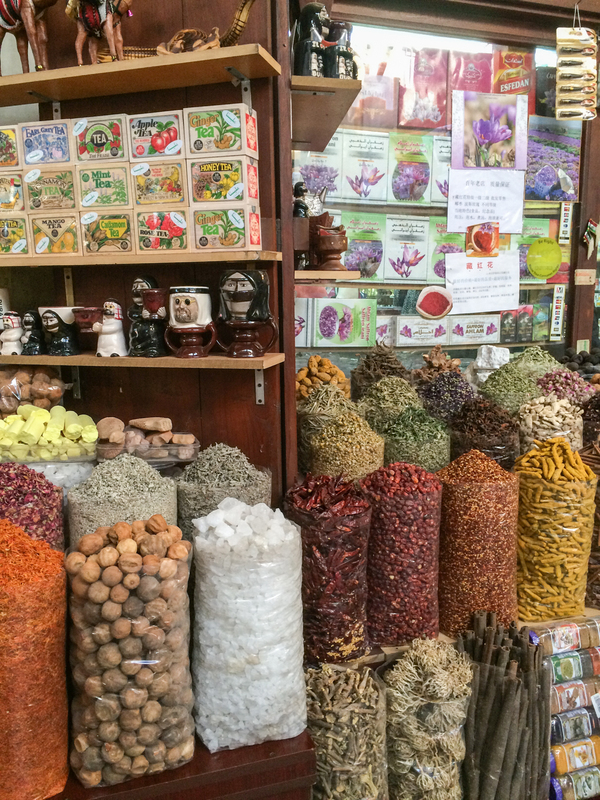 The fascinating and aromatic Spice Souk in old Dubai is a reminder of centuries of trade, even among regional rivals. Ride an abra, water taxi, across Dubai Creek and see small trading vessels from around the Arabian Gulf. 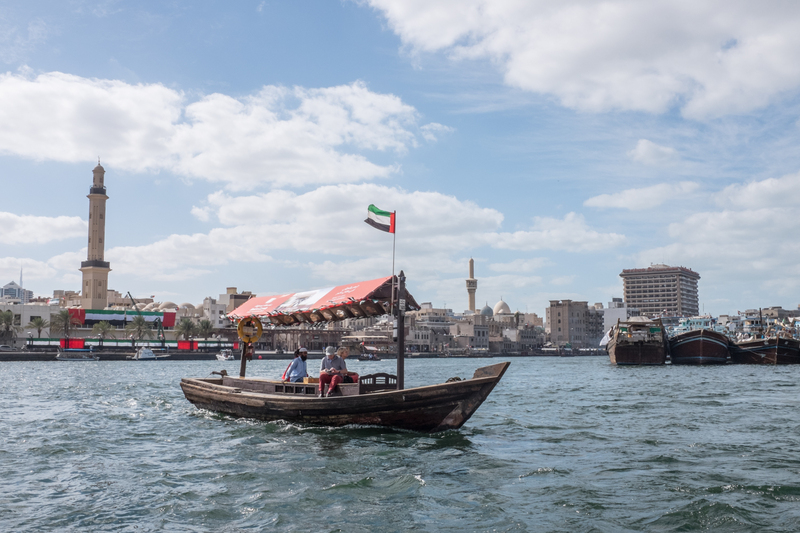 A ride in an abra, the traditional water taxi, across wide Dubai Creek gives you a sense of the early trading atmosphere of the area. Even with new container facilities in the larger port area, smaller vessels still ply these waters bringing goods to the souks and other local businesses and can be seen nested together along the quay. This view, along Dubai Creek, with mosque minarets and wind towers on the skyline, along with the haunting call to prayers, captures the imagination. 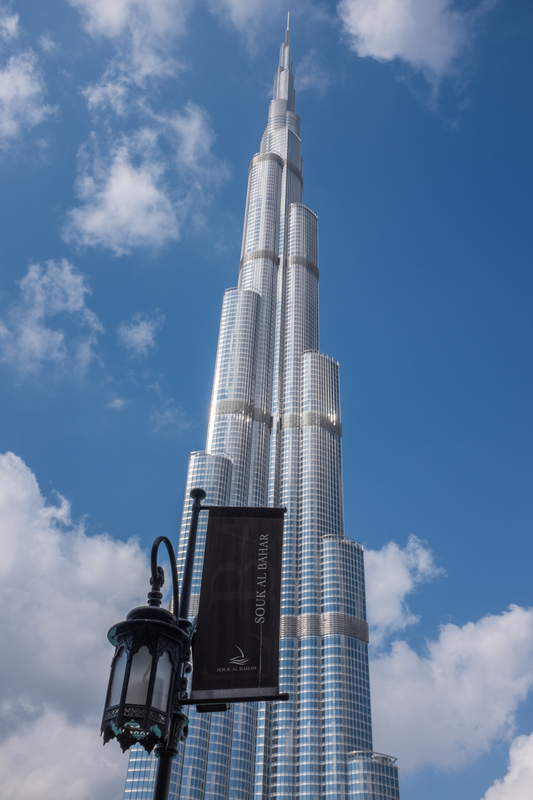 In this older part of Dubai, there is also a Coffee Museum (remember, coffee originated in this part of the world), the Dubai Museum and the Sheikh Mohammed Bin Rashid Center for Cultural Understanding, which is very much worth scheduling a visit. 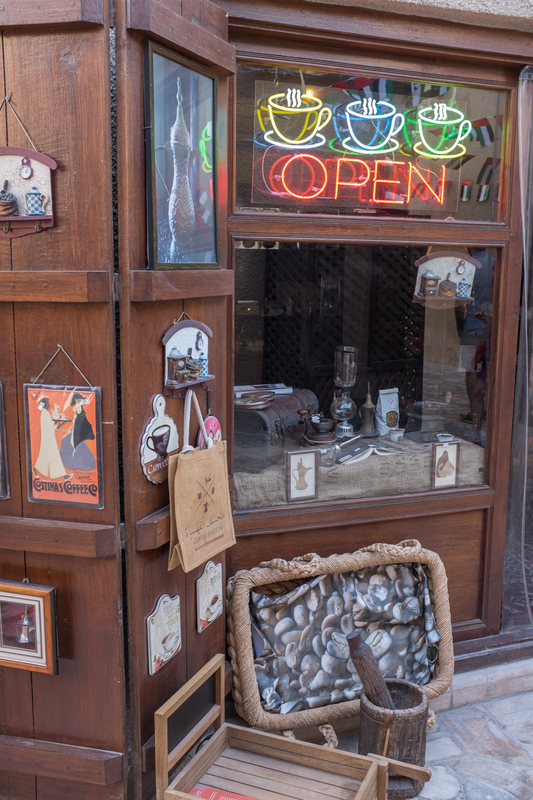 The Coffee Museum in old Dubai is a fascinating look at the history of coffee in the Bedouin culture. 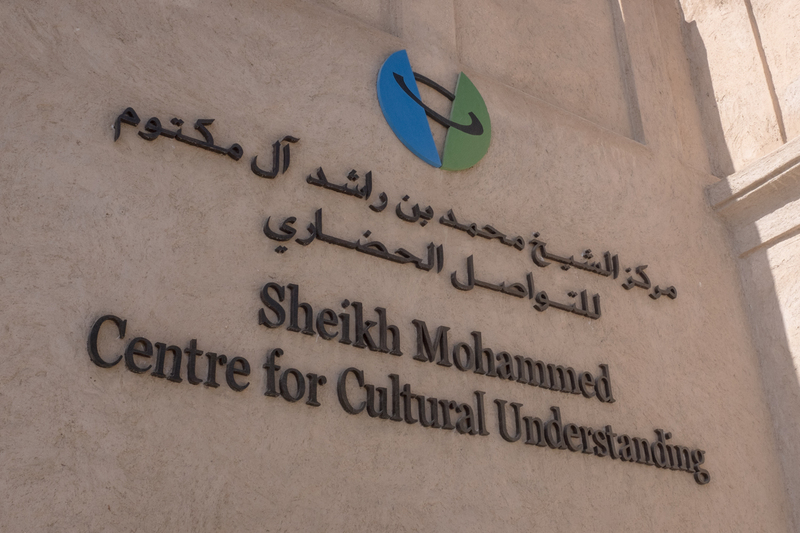 The Sheikh Mohammed Centre for Cultural Understanding lives up to its name in old Dubai. One of the docents at the Sheikh Mohammed Centre for Understanding enlightened us about Emirati life, education and social mores; even about dating from a young woman’s point of view. Dubai is a melting pot of cultures with workers from myriad origins: the Philippines, India, Pakistan, Malaysia, Africa, Europe and elsewhere. All the new high-rise and infrastructure construction has drawn many people with little or no work in their home countries. Additionally, the new hospitals, colleges, hotels and sports facilities have drawn expat professionals from all over the world. 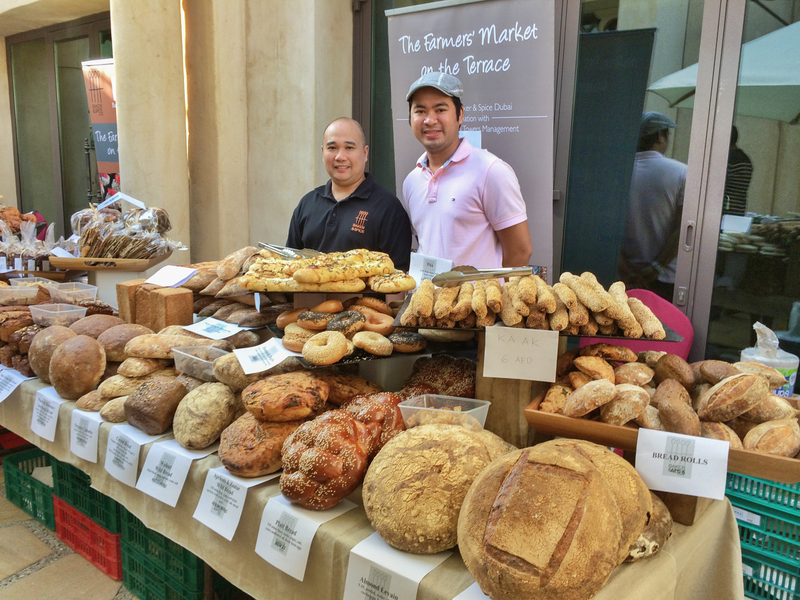 People from all over the world have come to Dubai to find work and opportunity, including these bakers from the Philippines. This is Captain Helen, from Ethiopia. She drives an abra launch at the Madinat Jumeirah hotel. Helen is an example of people from around the world who have come to Dubai to work. The man most responsible for Dubai’s smart vision and impressive growth is His Highness Sheikh Mohammed bin Rashid Al Maktoum, Vice-President and Prime Minister of the UAE and Ruler of Dubai. He is a very hands-on and involved ruler and can sometimes be seen driving his own vehicle through Dubai traffic without ceremony. 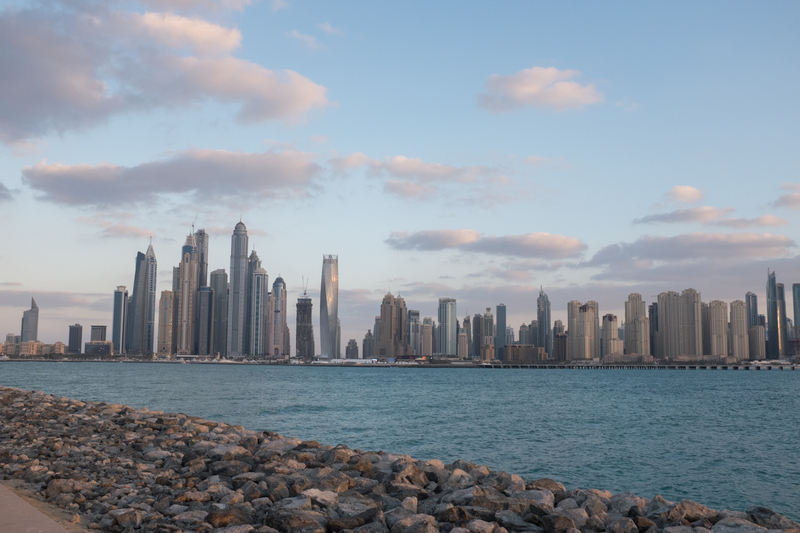 Accompanying Dubai’s astonishing architecture and development, Sheikh Mohammed has also encouraged sustainability and stewardship of natural resources, including seawater desalination, solar power and even a sea turtle rehabilitation facility. His extended family’s leadership and his close ties to other Emirati leaders, including Abu Dhabi’s Sheikh Kalifa bin Zayed Al Nahyan, is positioning the UAE to a future less dependent on oil. The Burj Kalifa, almost pinch-yourself unbelievable in its soaring height. The modern architecture that now comprises the Dubai skyline is stunning. The Burj Kalifa, at 163 floors, is currently the tallest man-made structure in the world. The observation deck is on the 122nd floor and provides a dazzling view of Dubai, the famous man-made islands offshore in the Arabian Gulf and the desert to the west. 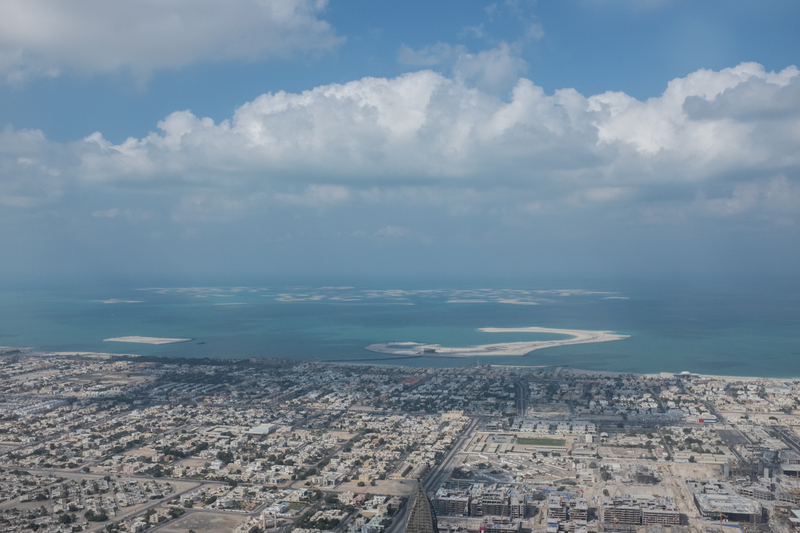 Views from the Burj Kalifa’s 122nd floor Observation Deck make it possible to see the man-made islands in the Arabian Gulf. 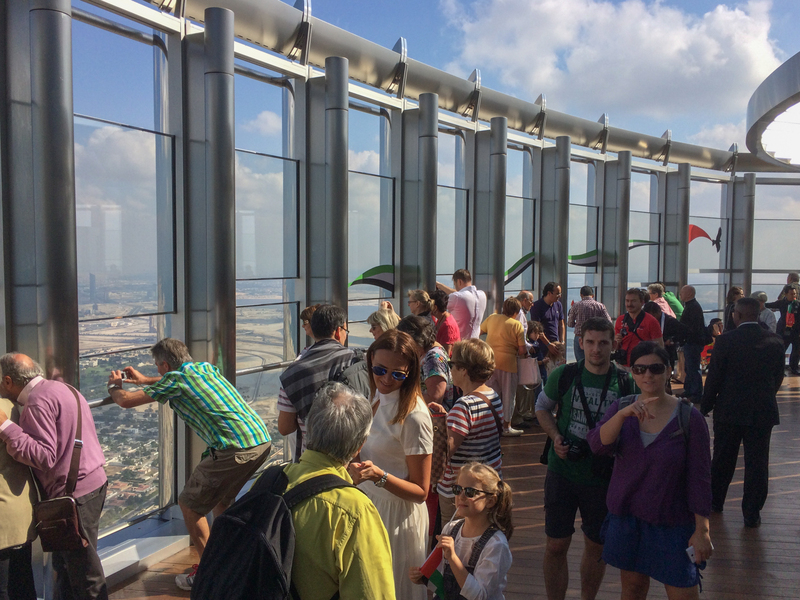 Visitors to the Burj Kalifa’s 122nd floor Observation Deck. Combining a visit to the Burj Kalifa with a trip to the Dubai Mall can be a full day, especially staying for dramatic lighted fountains in the evening. 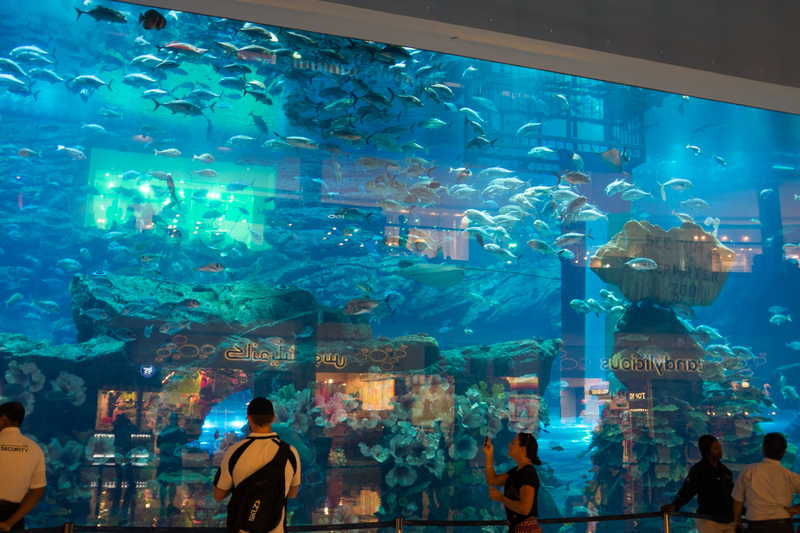 The Dubai mall contains a ski slope, an aquarium and about 1,200 shops. The Aquarium in the Dubai Mall. On the coast, along Jumeirah Beach stands the iconic Burj Al Arab, with its one of a kind sail-like architecture, heliport and restaurant appurtenances. Viewed from any direction, one just wants to stare at this unique 5-star hotel, built on an artificial island. The architecturally unique Burj Al Arab stands, sail-like on its own island. Further southwest, the causeway to Palm Island Jumeirah takes off and winds around this island made of sand and protected by rocks hauled from the mountain areas near Oman. From the air, Palm Island looks just like its name (and can be seen from space). This is one of the world’s largest man-made islands with sprawling villas and resorts. The vistas towards the shore from Palm Island’s wide promenades are equally impressive with new buildings surrounding the Dubai yacht harbor springing up weekly it seems. Some of the new construction in the Dubai Yacht Harbor area. We were lucky to be introduced to the staff of Venue & Concept, a boutique tour company with experienced and personable multi-lingual guides. 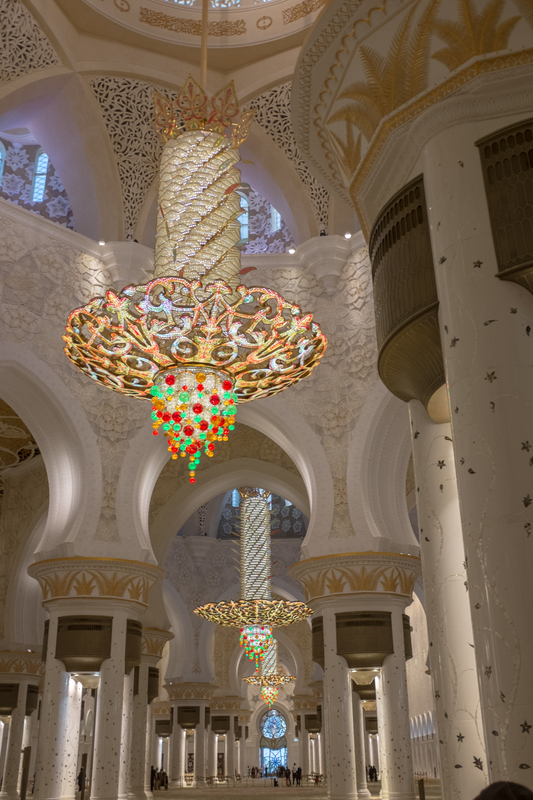 On one of the tours, Jorge Fonseca, Managing Partner of V&C, arranged a visit to the magnificent Sheikh Zayed Grand Mosque in Abu Dhabi, just an hour from Dubai. 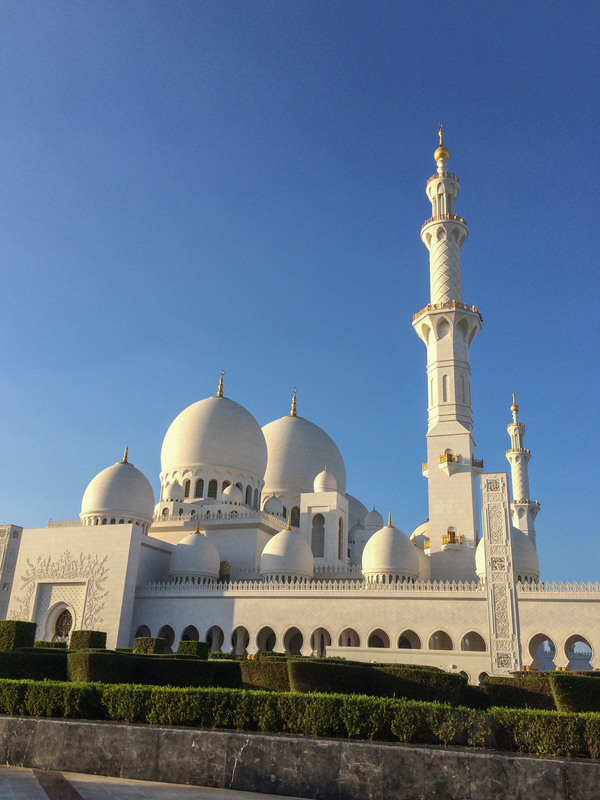 The remarkable Sheikh Zayad Grand Mosque in Abu Dhabi is a highly recommended visit. 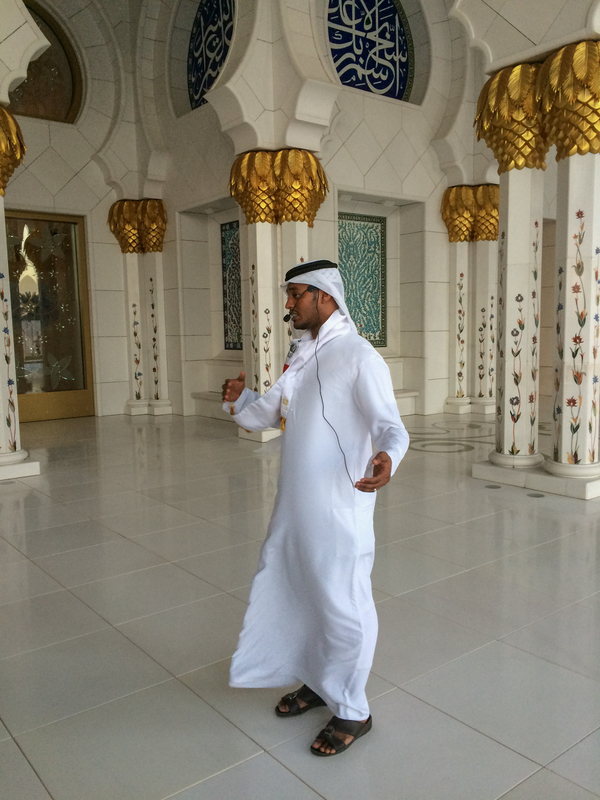 Docents at the Sheikh Zayed Grand Mosque are courteous and informative. The scale and oppulence of the Sheikh Zayed Grand Mosque in Abu Dhabi is amazing. 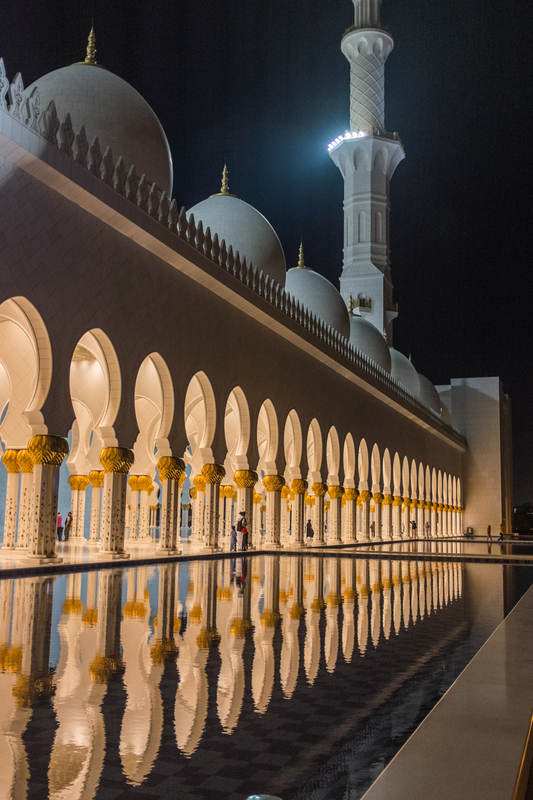 A night view of the Sheikh Zayed Grand Mosque in Abu Dhabi. The scale of the mosque is awesome. Inside, it is at once opulent, intricate and holy. Adhering to tradition, women must be covered and near the entrance abayas are provided at no charge. Guides take groups of visitors though the mosque and describe construction details, history and rituals of worship. As well as the Grand Mosque, Abu Dhabi will soon have a branch of The Louvre and a Frank Gehry-designed Guggenheim Museum. 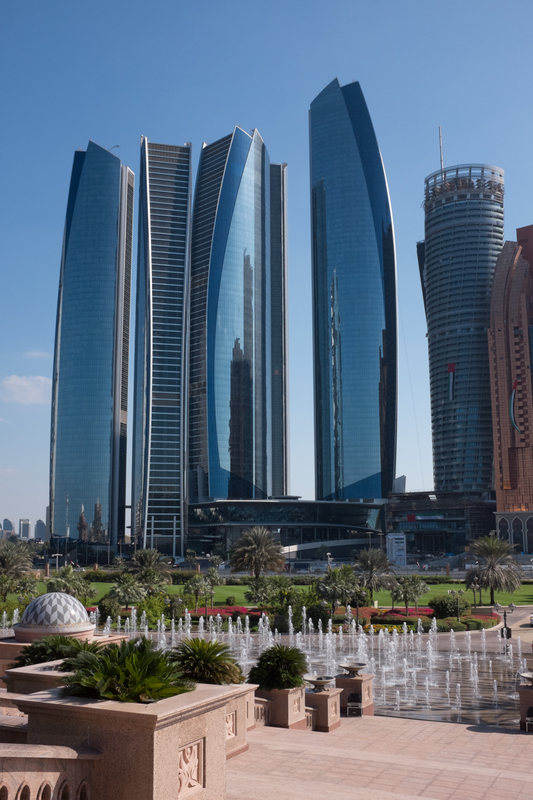 Abu Dhabi, Dubai’s neighbor and fellow UAE member is engaged in its own building boom. Our second hotel stay was at the Madinat Jumeirah resort, on the beach of the same name. This is a huge resort which shares the property with the equally luxurious Mina A’Salam hotel, all connected by a clever set of canals circulate with fresh seawater and are served by a flotilla of abras (water taxis) captained by hotel staff, both male and female. Convenient quays, with radio-equipped attendants mean that guests never have to wait too long for a boat. This is a fun way to get around the vast resorts and a very romantic and evocative ride at night. Also, there is no shortage of “buggies” (6-seater golf carts) if travel by the many paths is preferred. Both abras and buggies are electric-powered. The beach at the Madinat Jumeirah resort also includes a view of the Burj Al Arab. 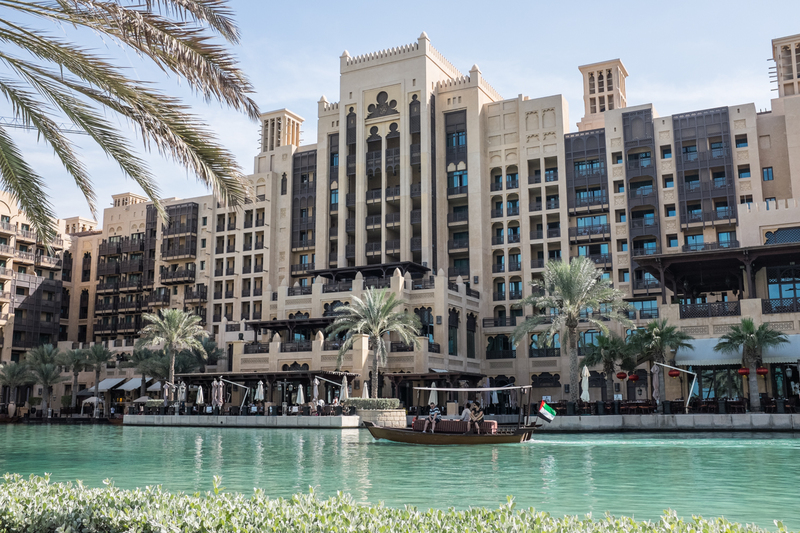 Abra launches move guests along the lagoons of the Madinat Jumeirah resort. 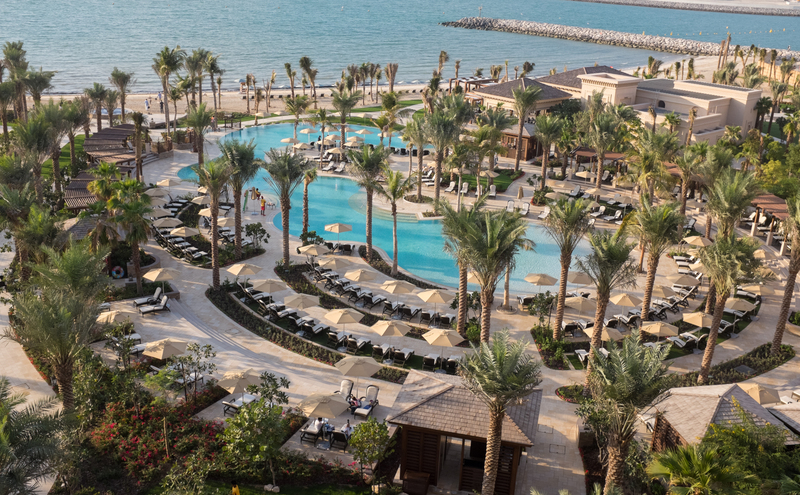 These lagoons are refreshed all during the day by sea water from the Arabian Gulf. Excellent restaurants abound between the two hotels and the beach isconvenient and well-staffed with attendants. We stayed in one of the Dar Al Masyaf Villas at the Madinat. Each villa has about 10 large rooms on two floors surrounding a large courtyard, plus a wonderful butler service, which includes a delightful happy hour in the evening in the common main salon or the patio. The butler is more like a concierge and can arrange just about anything from his/her desk in each villa’s reception area. Each villa also has a refreshing large pool, monitored by a lifeguard, and surrounded by comfortable lounge chairs. 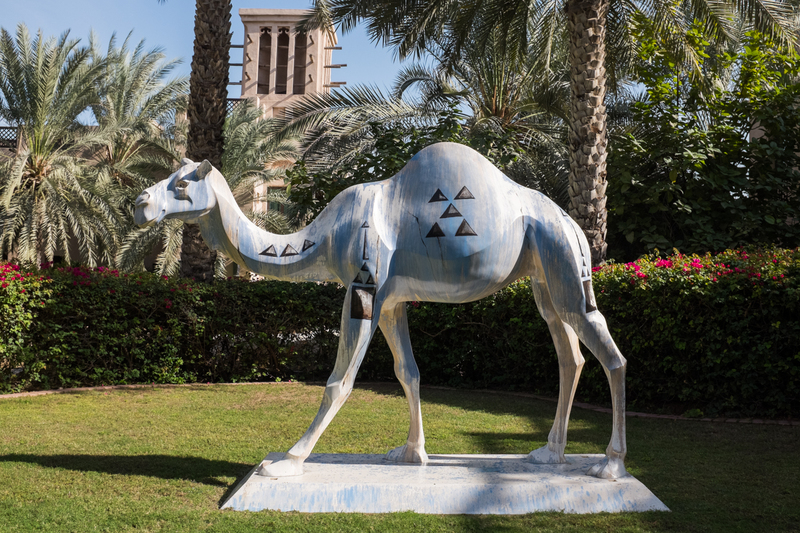 The Dar Al Masyaf concept is particularly good for groups and families. 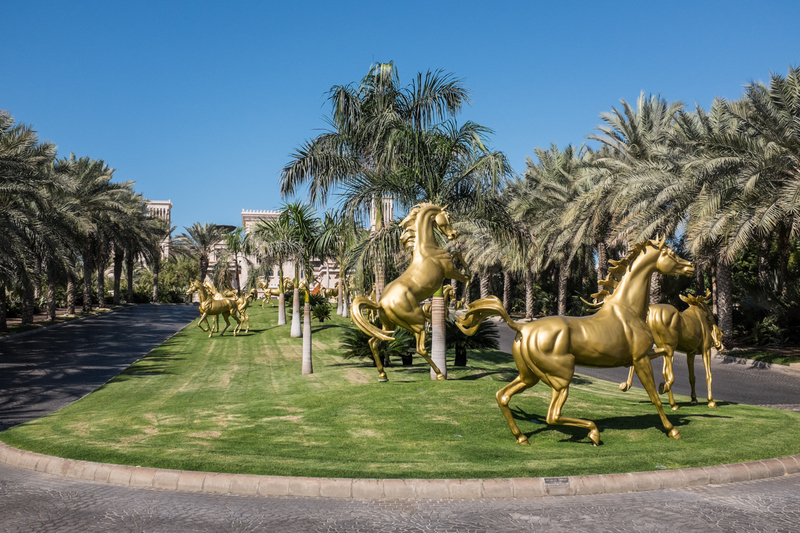 Magnificent Arabian horse sculpture at the grand entrance to the Madinat Jumeirah resort depict the Emirati’s deep love for horses. 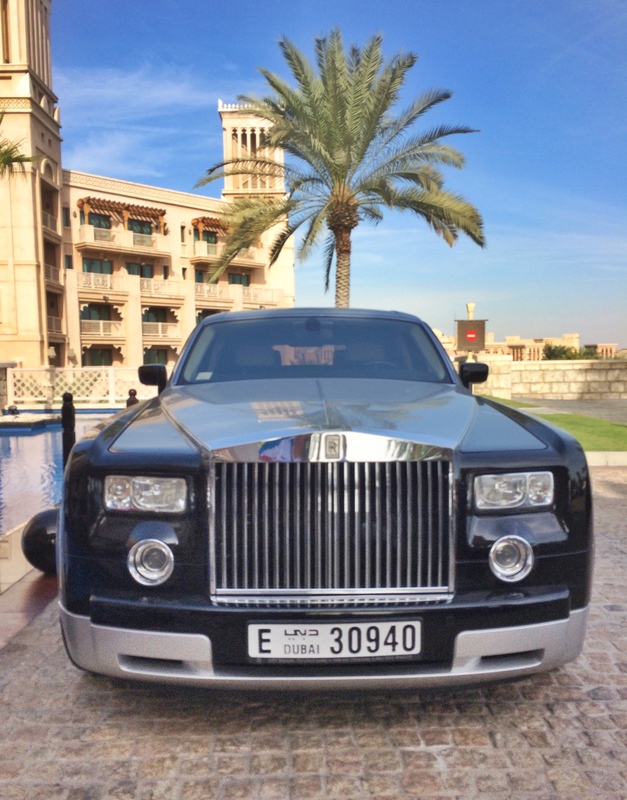 I like to call this a “Dubai Pontiac.” Parked in front of the Madinat Jumeirah resort. It was from the Madinat that we embarked on more adventures, including a posh visit to the world-class Meydan Racetrack on the outskirts of the main city. Horse breeding, racing and other equestrian endeavors have deep roots in Arabian culture and here at Meydan is the modern manifestation of this great sport. No expense has been spared to create arguably one of the finest horse racing facilities in the world. If you visit, try to dine at “Silks” in the Clubhouse. 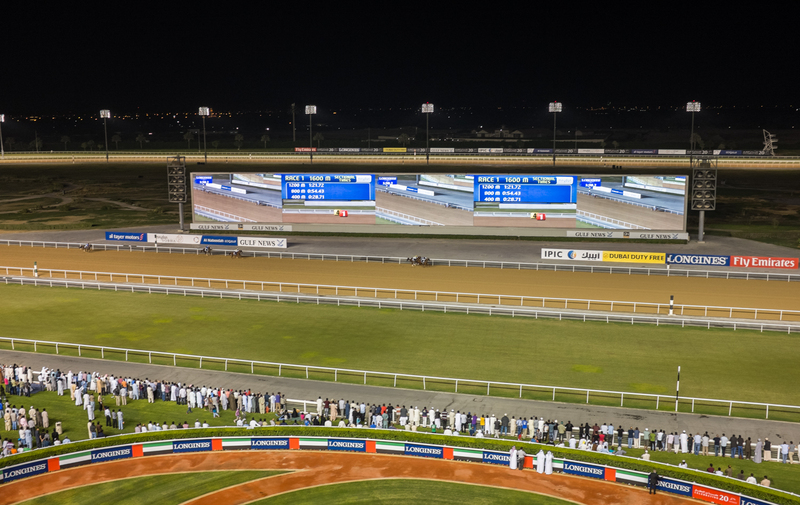 The vast and elegant Meydan Race Track, one of the world’s finest horse racing venues. Another outing took us to the grandstands of the “Dubai Rugby Sevens,” competition, part of an international tour that brings men’s and women’s country teams such as South Africa, Fiji, Australia, Great Britain, U.S. and Europeans into fast-paced time-sensitive matches of great importance in the world of rugby. It is fun to watch, easy to understand with a brief study, and yet another example of Dubai’s committed effort to become a sports tourism destination. 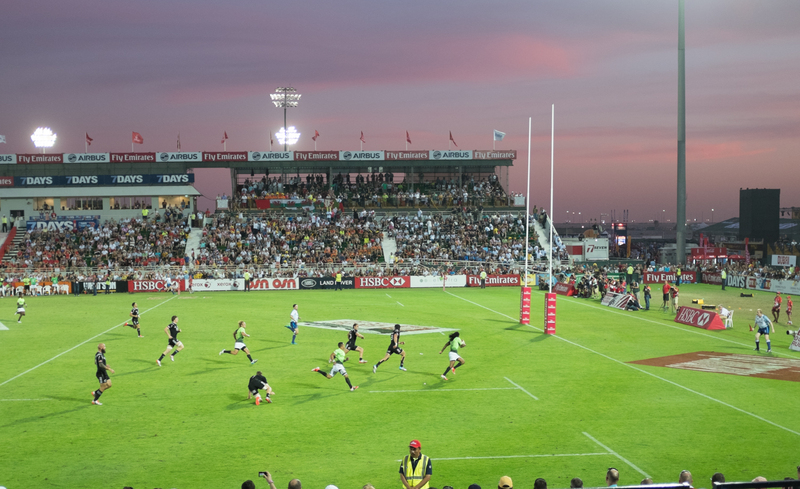 Rugby Sevens international tournament at Dubai’s rugby stadium. 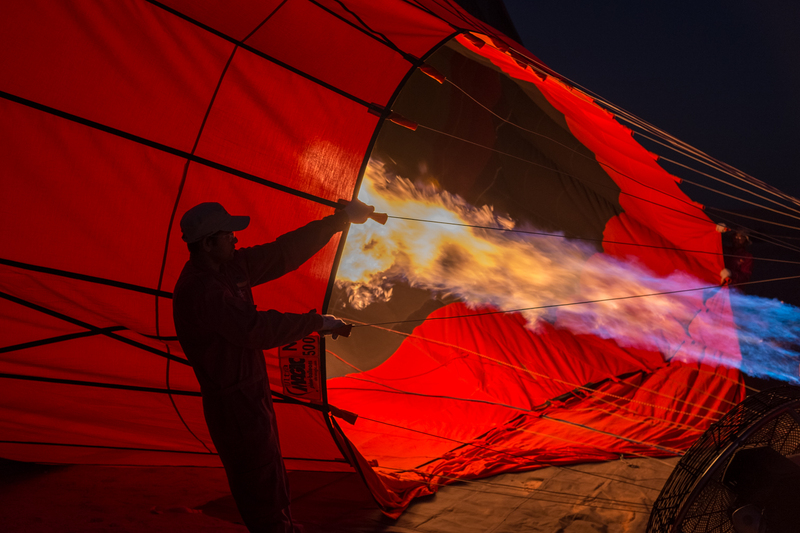 Filling the balloon with hot air in the pre-dawn. 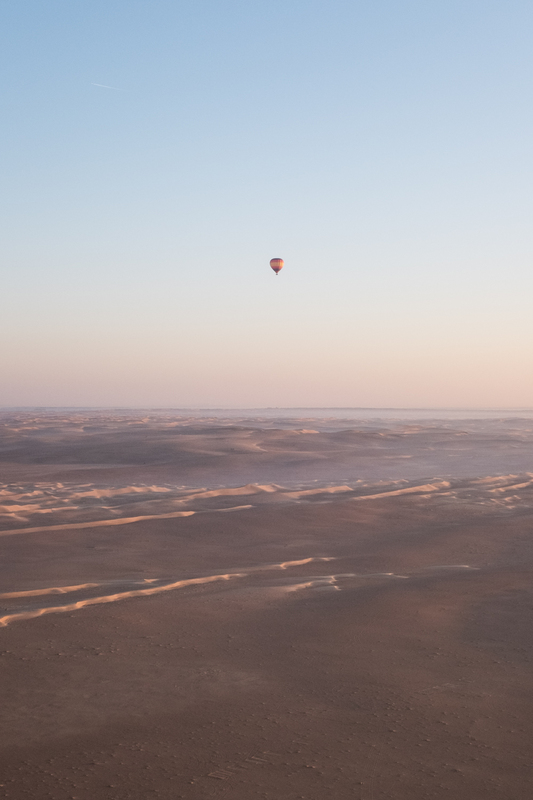 A desert hot air balloon voyage in Dubai can be dreamy. Dubai is trying to get it right for the future of her people. Her rulers know that the end of oil is right around the corner. Re-invention is the key and in a place where the sun shines almost every day the construction of world class attractions continues apace. 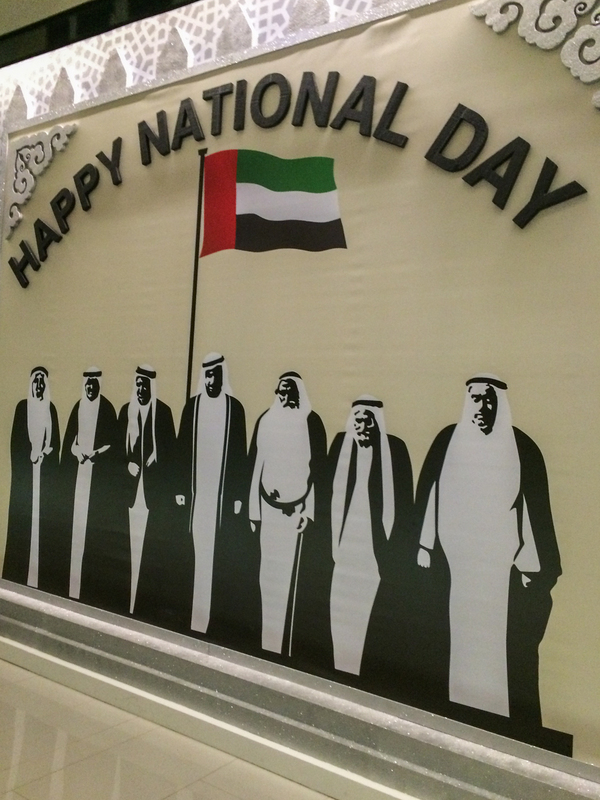 The UAE has tremendous national pride. A solid, sustainable infrastructure is in place for this growing destination as well as a firm commitment to the safety and security of Dubai’s citizens and visitors. Dubai won the right to host The World Expo 2020 and, based on the progress being made, it promises to be a big success. HEALDSBURG, CA – Welcome to the New Healdsburg…Who knew? New York New York, It’s (always) a Wonderful Town!